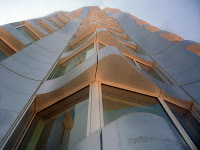 In February 2011, the New York by Gehry building finally opened its doors to occupants. This 76-story, 870-foot tall skyscraper in Manhattan is now the tallest residential building in the Western hemisphere. With 903 apartments, this new structure’s total occupancy is greater than some depopulated rustbelt towns. A structure of such significant scale should be examined for the physical, social, economic and environmental impacts that it—and the governmental regulations that helped finance it—will have on its community. 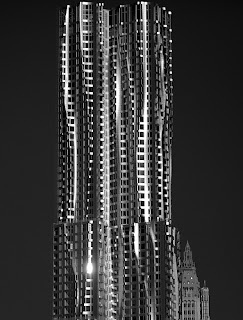 While it will surely become an iconic addition to the skyline, New York by Gehry exhibits only the barest elements of environmental conservation and economic equality, and has therefore missed a great opportunity to become known for arguably more important contributions to New York City. This is an unfortunate consequence of both the developer’s priorities and the lack of appropriate governmental regulation. In addition to praise, a few criticisms have also been leveled against the structural design. One is that the undulating folds, which catch the sun at different angles throughout the day, were only chosen for three sides of the building. The structure’s south side is flat, and looks to some as though the building “presents its backside” to Wall Street. Others criticize the unique exterior design for not translating into the interior of the apartments. Notwithstanding these minor criticisms, most agree that the building adds additional vitality and dramatic flair to lower Manhattan’s skyline. If the designers of New York by Gehry had been inclined to reduce the building’s environmental impact, they could easily have taken a cue from recent residential additions in neighboring Battery Park City. Best practices in environmentally-friendly, low carbon residential high-rises are evident in buildings such as The Solaire (LEED Gold), The Visionaire (LEED Platinum) and Tribeca Green (LEED Gold). The Solaire, for example, lowers energy demand by utilizing about 450 solar panels, built into the building’s façade. 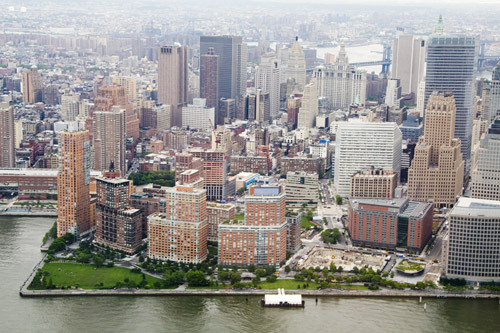 These “green” buildings exist in part because the Battery Park City Authority (BPCA), charged in 1968 with redeveloping the dilapidated former Port of New York area into a mixed-use neighborhood with public space, adopted a policy in 2000 that requires developers to build environmentally sustainable apartments. Under the BPCA policy, structures in the area must address indoor air quality, water conservation and purification, energy efficiency, recycling of construction waste, the use of recycled building materials and building commissioning to enhance building performance. BPCA even created a user-friendly best practices document that details the ways in which sustainable measures have been successfully integrated into neighborhood residential buildings. All 903 dwellings in New York by Gehry are luxury apartments being rented at current market rates: studios start at $2,630-per-month, one-bedrooms are $3,580 and two-bedrooms $5,945. Units are not for sale. Despite being marketed only to the affluent, a substantial portion of the financing for the project came from public bonds and government tax breaks. The building was built, in part, with $203.9 million in tax-free financing from the New York Liberty Bond Program, a pool of funding administered jointly by the New York State Housing Finance Agency (HFA) and the New York City Housing and Urban Development Council (HDC) that was made available after September 11, 2001 to help rebuild lower Manhattan. Under the Liberty Bond Program, developers need only pay a three percent affordable housing fee (approximately $6 million in the case of New York by Gehry) rather than setting aside affordable units within the building itself. This is a departure from the HFA’s traditional program which requires 20% of units within buildings financed with tax exempt bonds to be set aside for affordable housing. Although the goal of rebuilding lower Manhattan is a noble one, if one were really concerned with maximizing affordable housing, the 3% fee option achieves significantly less desirable results than the traditional 20% affordable housing rule imposed by the HFA. According to HDC, it “constructed 467 affordable housing units using approximately $31.4 million in fees derived from previous Liberty Bond transactions.” This equates to a cost of $67,237 per unit of affordable housing. Using these figures, the $6 million fee paid by Ratner for New York by Gehry bankrolls 89 affordable housing units outside of the building. By contrast, twenty percent of 903 units would have made 180 affordable housing units available within the building. Additionally, although no affordable housing units were included within the building, all apartments in New York by Gehry will ironically be rent stabilized for the next 20 years. Because the building was financed in part by government dollars, it was also eligible for a 421-a 20-year tax exemption (which Ratner applied for just before amended requirements came into effect in June 2008 that included compulsory on-site affordable housing requirements). A requirement of properties included within the 421-a tax exemption is that the building’s units are reviewed by the Rent Guidelines Board, and generally subject only to periodic rent increases of 2-3 percent. Thus, while tenants of New York by Gehry are clearly willing and able to pay top dollar for their luxury apartments, they will enjoy modest incremental rent increases—a policy intended to keep middle and working class citizens from being priced out of their neighborhoods. Rent stabilization applied in this way seems a far cry from what the program was initially intended to accomplish. New York by Gehry isn’t entirely residential: its lowest six floors house public facilities, including a five floor K-8 public school financed with public dollars, and one floor for the New York Downtown Hospital. This type of mixed-use allocation is generally positive, as it allows for community interaction and connection. However, the New York by Gehry design seems to have deliberately minimized the opportunities for such social connections: the entrance to Public School 397 “is on the east side of the building, separated from the residents’ entrance on the west, so the streams of children arriving and lawyers and bankers leaving for work do not have to cross.” Perhaps this lack of contact is the reason why the school recently had trouble with residents from the above floors carelessly dropping bottles onto the school’s playground. This social isolation is further reinforced by the fact that the plethora of luxury amenities within the building mean that residents will seldom have to venture outside their building—or tax bracket—for socialization and recreation. Although residents likely enjoy the building’s 50-foot swimming pool, fitness center and spa, grilling terrace, game room, drawing room with grand piano, chef’s kitchen, library, “tweens den,” children’s playroom, screening room, and “comprehensive concierge and lifestyle services”—the unfortunate result may be that the need for interaction with a diverse greater community will be minimized. Jane Jacobs, longtime critic of New York urban planning, would decry the lack of social interaction on street level and among those of differing backgrounds. 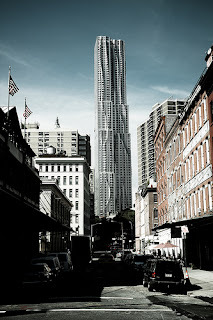 In sum, New York by Gehry achieves success in some areas but misses meaningful opportunities in others. Its architectural contribution to the New York City skyline is undoubtedly significant. And it helped to bring renewed interest to previously devastated lower Manhattan. On the other hand, it reinforces the need for stricter governmental regulations regarding environmentally sustainable and economically equitable building practices. 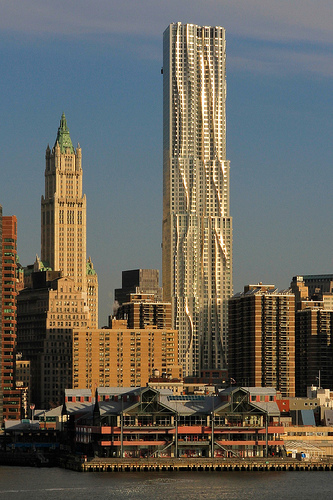 New York by Gehry’s developers took advantage of a public bond program that stipulated weak affordable housing requirements in the name of rebuilding of lower Manhattan, and rushed to finalize plans before more stringent affordable housing rules for 421-a tax abatements were implemented. They eschewed LEED and other environmental design best practices evident in nearby Battery Park. And they ultimately designed yet another socially-isolated luxury apartment. 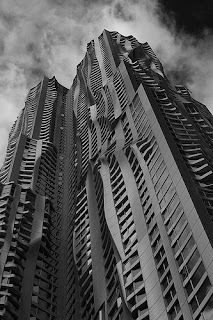 In short, rather than innovate, those involved with New York by Gehry did what many other private developers regrettably do: create the most profitable, rather than most socially beneficial structure. We must do better. Perhaps Frank Gehry had it right: the most effective way to achieve sustainability is to mandate it. Stronger sustainable building and design standards can contribute meaningfully to the re-development of urban neighborhoods—especially in areas targeted to receive governmental assistance. If sustainable building design remains voluntary or subject to weak government regulations, opportunities for truly innovative approaches to the built environment will be missed, as they were in the case of New York by Gehry. ⃰ This essay is a modified version of an article I originally published on April 11, 2011 on renewcities.org. The Solaire: 20 River Terrace, New York, NY 10282; The Visionaire: 70 Little West Street, Battery Park, NY 10004; Tribeca Green: 325 North End Avenue, New York, NY 10282. 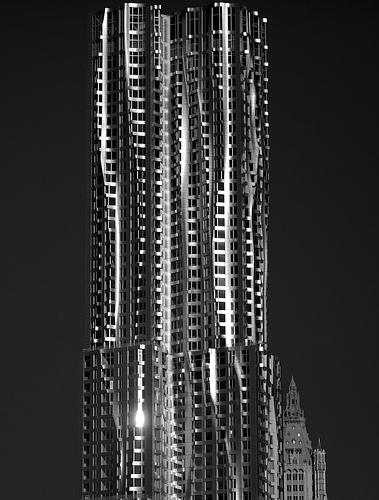 See New York by Gehry official website, supra, n.6. Photos by flickr contributors Structures:NYC, emmett.hume, Alex Terzich, Atomische • Tom Giebel, jikatu and onesevenone.